Abstract—Established design and fabrication guidelines exist for achieving a variety of motions with soft actuators such as bending, contraction, extension, and twisting. These guidelines typically involve multi-step molding of composite materials (elastomers, paper, fiber, etc.) along with specially designed geometry. 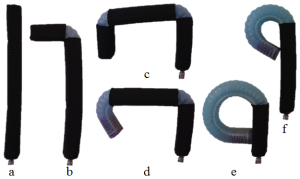 In this work we present the design and fabrication of a robust, fiber-reinforced soft bending actuator where its bend radius and bending axis can be mechanically-programmed with a flexible, selectively-placed conformal covering that acts to mechanically constrain motion. Several soft actuators were fabricated and their displacement and force capabilities were measured experimentally and compared to demonstrate the utility of this approach. Finally, a prototype two-digit end effector was designed and programmed with the conformal covering to shape match a rectangular object. We demonstrated improved gripping force compared to a pure bending actuator. We envision this approach enabling rapid customization of soft actuator function for grasping applications where the geometry of the task is known a priori. K.C. Galloway, P. Polygerinos, C. Walsh, R. Wood, “Mechanically Programmable Bend Radius for Fiber-Reinforced Soft Actuators.” IEEE ICAR, 2013. K.C. Galloway. Mechanically Programmed Soft Actuators with Conforming Sleeves. International Patent Pending, application PCT/US2014/060870. The proposed sleeve reinforcement method improves shape matching to angular objects and holding strength. Proposed sleeve reinforcement can be quickly modified to create a wide range of motions from a single soft actuator.